Lost spoilers for the Swedish Chef? 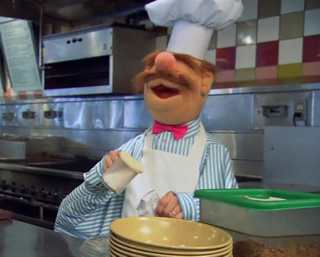 The Muppet Show: The Swedish Chef Gets Lost Spoilers? By the way, when did the Swedish Chef get married? Check out his ring finger! Lost: Time for an Anniversary Cast Reunion? The Muppets: Which Star Won’t Be in the New Movie? Lost: Jorge Garcia Talks Finale, Epilogue… and Walt’s Fate? Lost: Still Have Questions after the Finale? Well, There’s More! Life on Mars: Can Lost Help Save the ABC TV Show from Cancellation? The Muppet Show: Going Back to the Theatre? The Muppet Show: Kermit the Frog and Friends Returning to Series Television? Wow, how lame. It’s blocked in Canada on copyright grounds. Those of us that want to watch it, will find some other way to. ABC isn’t doing themselves any favors in the least by doing this.